The most discussed subject in university board meetings, after finance and capital projects of course, is most likely to be communication and its connection to public relations. Universities know that they are failing at it, yet they don’t seem to know what to do. I will argue here and in the next two posts that Social Media can and will reverse this situation as universities have now the potential to shape and even dominate the news circuit. In his article, “The Soviet style world of university PR”, a former University president, Ferdinand von Prondzynski, writes that universities have been unable to persuade the wider public of the merits of what they do and of the quality of their achievements, because they don’t know how to communicate. Underwhelming indeed for institutions that are constantly scrutinized and attacked. “The right” keeps dumping on the ivory towers, the “pampered” faculty, the fiscal burden on the public purse, our never-good-enough teaching ways, the “non-competitive” nature of the tenure system, the “recklessness” of our academic freedoms, not to mention the liberal agenda of some of our “too humanistic” departments. “The left” moans about the corporate university, the advent of the managerial university, its newly enforced role in wealth creation, in leading the innovation agenda … whatever this means, etc. Universities have traditionally tried to imitate governments, corporations, and other top-down institutions by relying on their public affair departments to funnel one-way communications. But for various reasons, universities’ efforts at communicating their message to the public have always fallen short. They are not winning many of the arguments in the eyes of the public. There are many reasons for this failure. But I will try to describe in the next post how the new media provides opportunities not only to remedy every one of these deficiencies, but also to put universities in the driver’s seat after being shunned for years, courtesy of the neglect by traditional 20th-century media outlets. In an information world dominated by the old media, the name of the game has always been to focus the message, and to pitch the right story hoping that the traditional outlets will either adopt it and disseminate it, or simply do so for a price. The problem is that almost by definition, universities have a too-large and -diverse pool of stories to tell. Focusing their message goes against their very “raison d’être”. Unlike universities, command and control organizations such as businesses or political parties have always been well structured for traditional media. For them, information flows from top to bottom and so their communications departments sit near the top, communicating a coherent and consistent message. Traditional media, is also top-down, communicating a message “to the masses” with little room for debate and discussion (letters to the editor are a poor excuse for open dialogue). This is not a university friendly format. University Administrations, which are essentially the only conduit to traditional media, are de-facto conservative and risk averse. “Think of an important or sensitive issue, and you can be sure that any university’s position on it is to keep very silent in public”. Delving openly and critically in Government policies for example is out of the question. There has always been a historical mindset within universities that considers any active PR policy to be something that cheapens the noble aims of education. I, for one, can hardly hide my displeasure, whenever I have to sit through another presentation to the Board by a Toronto-based professional in branding services! This academic “puritanism”, if you will, has led to low budgets dedicated to PR and marketing, which then of course restrict the universities capacities at buying exposure to their success stories from the mainstream media. Relying mainly on “earned media” coverage is not enough in this day and age. Social media technology is already changing how organizations and governments operate and communicate, but I will argue in the next post, that universities will be the major beneficiaries of this revolution, bringing them a tremendous opportunity to shine. Oops! 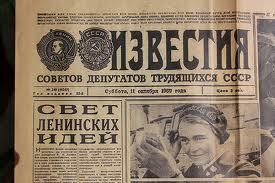 I knew it was Izvestia but didn’t have a clue what did it say.